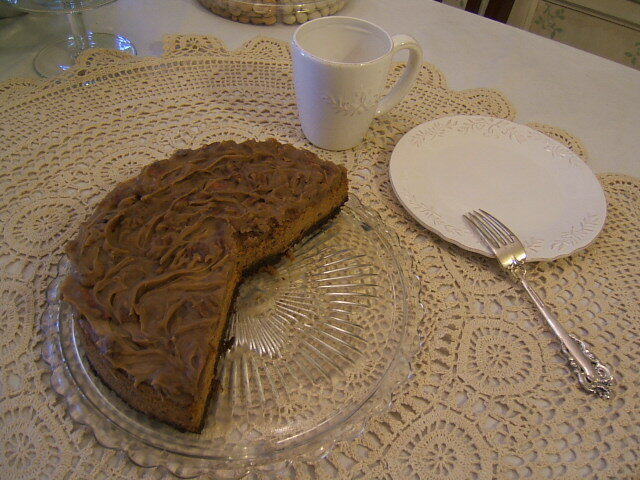 Fairy Cottage and Garden..... Re- Enchanted Life of a Domestic Mystic: Praline Pumpkin Cheesecake! 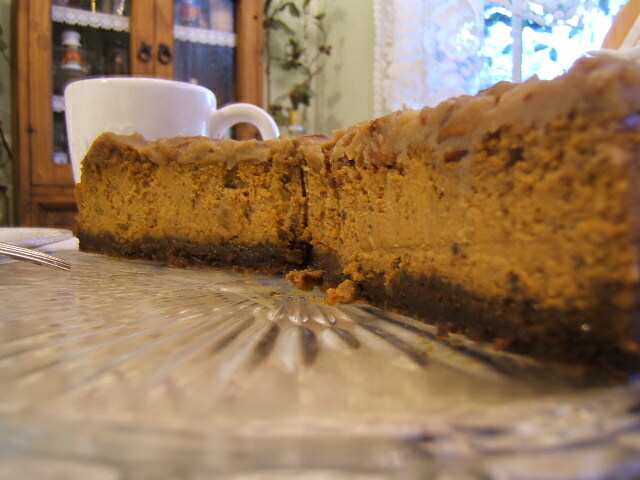 Today is about a happiness and a beauty I have discovered in a Praline Pumpkin Cheesecake. Maybe others have discovered this decadence already but I only just did when my housemate brought home one of those pies from Whole Foods Market and I did taste it and whoa! lol....and I'm NOT a sweets person, but this was amazing. And this beigy gooy stuff on top! what was that??? John told me it was the "Praline" part....such a pretty word.......Praline?! How did I live without this all my life?! I just had to find out what this is and how in heaven's name is this made! I found it so amazing I had to look up this culinary miracle and see how in the world it was concocted.....I always find things like this to be small miracles that are impossible to do, but lo and behold, it was a simple recipe! Much easier than I thought....so easy, LOL that I've made two of these cakes by now LOL and it only just occurred to me to post it. So I will post the youtube and the recipe too. I did make an adjustment in the salt amount in the praline part because I did find it too salty the first time with a 1/4 tsp of salt, and so the second time I made it, I just added a pinch. Also since pumpkin is not readily available, having been deemed a ''seasonal'' item, I used pumpkin pie filling and it worked well. Only I did use the entire 32 ounces by mistake which I realized after I had baked it and finding the inside still a bit too soft, and I then freaked out realizing then I used 32 ozs instead of 15 oz! and thought I had ruined the entire thing and I even called the company and asked for help and they said it was basically ruined and that it would be too watery to hold up, but !..... I left it overnight in the fridge and it held up beautifully and so I finished it off with the praline and it was perfect!. The second time I made this, there was no more pumpkin anywhere to be found so I substituted sweet potato pie filling for the second one and it works just fine using the entire 30 ounce can and I will stick to it this way. Another thing is the praline is not firm enough to spread after just 10 minutes of cooling after it boiling unless you like it runny, so after it cooled I put it in the fridge for about 15 minutes, then it thickened enough for it to stay on top. For those with no kitchen gadgets like me, I tried to mix the cream cheese by hand which did not work out, so I had to heat it in a double boiler type thing to soften it, and then I could mix by hand with a spatula.....for those of us who like to do things the old fashioned way LOL. This cake does not require tools but a mixing bowl and spatula and the springform cakepan to bake it in and be prepared to not be able to eat it until the next day. 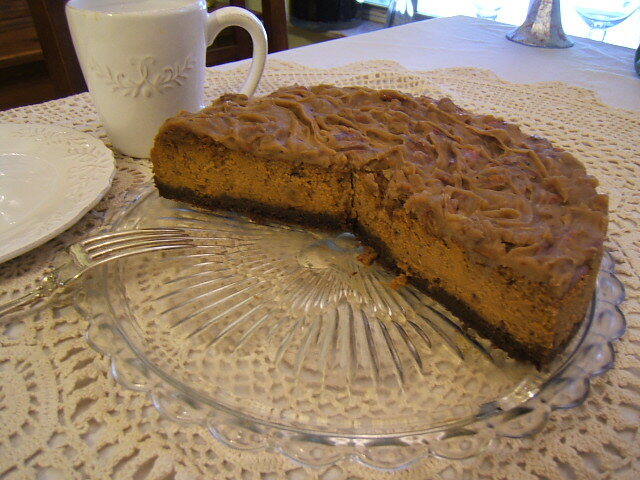 To make cheesecake crust, use a rolling pin or food processor and crush gingersnaps to obtain 2 cups. Add melted butter and combine well. Press onto bottom of a 9-inch diameter spring form pan and place in oven for 9 minutes. When cool enough to handle, place pan on 3 layers of aluminum foil and wrap outside of pan with foil. Ensure that no water could penetrate through foil. Place pan in a roasting pan and set aside. To make pumpkin cheesecake, beat soft cream cheese and both sugars on low speed until well blended with no lumps. Scrape bowl well. Add one egg at a time waiting for previous added amount to be fully incorporated. Scrape bowl and beater well in between additions. Add pumpkin, spices and vanilla and mix to combine - do not beat, just mix by hand. (Don’t overbeat cream cheese mixture.) Pour into cake pan over ginger crust. Pour water into roasting pan, about an inch high, and place in oven. 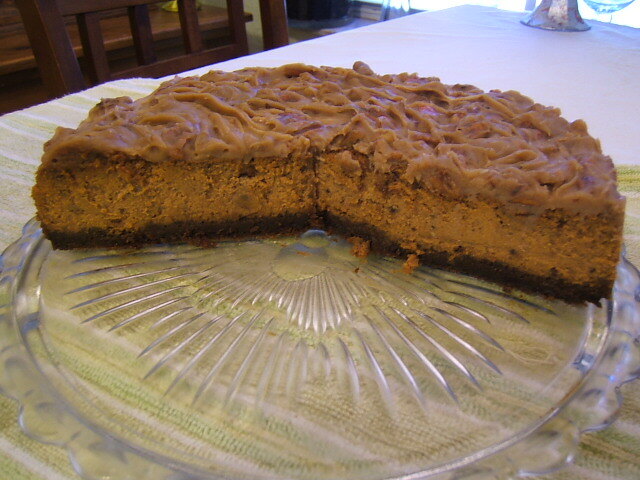 Bake pumpkin cheesecake until center of cake no longer trembles, about 1 hour and 45 minutes to 2 hours. You could also try baking for 1 hour and 45 minutes, turning oven off, then opening oven door and letting cheesecake cool off and continue baking at same time from residual heat. Pull roaster out of oven and pull out your cheesecake. Allow cheesecake to cool on a rack at room temperature for 30 to 60 minutes. Place in refrigerator overnight. Bring your cake out of refrigerator about an hour before serving to bring it to room temperature. Remove outside of springform pan. Make praline topping before serving to your guests for best results. Begin by toasting pecans for 8 minutes in a 350°F oven if desired. In a saucepan, bring all ingredients to a boil excluding pecans. Boil for 3 minutes ensuring that mixture will not boil over. Remove from heat and stir in pecans. Allow to cool for 10 minutes and spread on surface of cake. Run a sharp knife around edge and bottom of cheesecake in pan to remove from pan. Use a sharp knife to cut as desired. Now that I look at their (deleted) picture I see half of their cake is crust...and they used more pecans, I prefer less. This is one of the most wonderful things I've ever made! yum yum! Please look up the recipe for Sticky Toffee Pudding from the Undie Arms Hotel, not kidding that's the name! This is a super rich cake with toffee poured over it. The first time we tried this was in a little tea shop up in Scotland, it then became our fave recipe ever!!!! Your cheese cake looks divine, and fairly easy, thanks! oh no LOL I'd rather not fall in love with another cake! Its already bad for me to eat this much sweets in one month time, so I'd not want to crave another too :D...but it did look interestingly and delish too! How absolutely LUSCIOUS my dear! I cannot eat rich cream cheese, but the memory of it when I COULD eat it is fabulous. And with pumpkin? DROOOOOL! Are you enjoying creativity? Any more painting? I have had to really trim down my schedule and focus on drawing now; I have to work more days now as a teacher than I started out with this year, so my schedule is now focused on improving my drawings and I am trying to read and write more. I sure miss baking, however! No creativity right now, am occupied with mundane things, and in this mode creativity goes out the window, I just cannot get into that place when I have to deal with these things. Glad you are enjoying your writing and teaching, you are needed. xoxoxo + lots of love!!! I love your blog! So beautiful and inspirational! Would you ever considering posting your photos on Instagram? You would inspire many people!! This sounds yummy! I like your version with less crust. Thanks for sharing the recipe at the Open House party. Beautiful friend...please let me wish you a belated HAPPY BIRTHDAY! I hope you had a LOVELY day! This cake is indeed drool-worthy...wow! I would love to get that little something to your door! and lol, Kaisa.....yes, she remembered my birthday and I got a few beautiful wishes which saved my day which was going into depression ;-( but enough remembered and saved it! LOL.....and now I thank you!. Thank you for your comment and yes it is an entirely interesting combination, if you haven't tried it yet, you may love it! I have enough pumpkin and sweet potato for the rest of this year now LOL!